My mother usually visits us in summer from India, and one of the highlights of her trip is for me to share new seasonal recipes with her and of course re-work and perfect traditional favorites. In fact, about three year back when I was working on the Bengali Five Spice Chronicles, I had put mom to very hard work testing and reworking the recipes, hopefully all for a good cause. So, this week’s recipe was something my son and I created just for mom, using the grape leaves that are found in complete abundance in our yard. 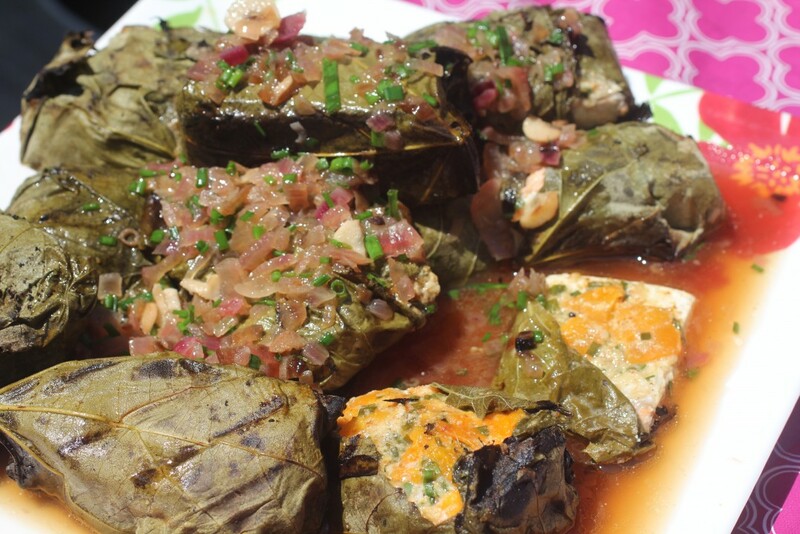 My son loves my dolmas or stuffed grape leaves, and I shall share my recipe for those on a different day, today I wanted something less fussy and quick cooking. 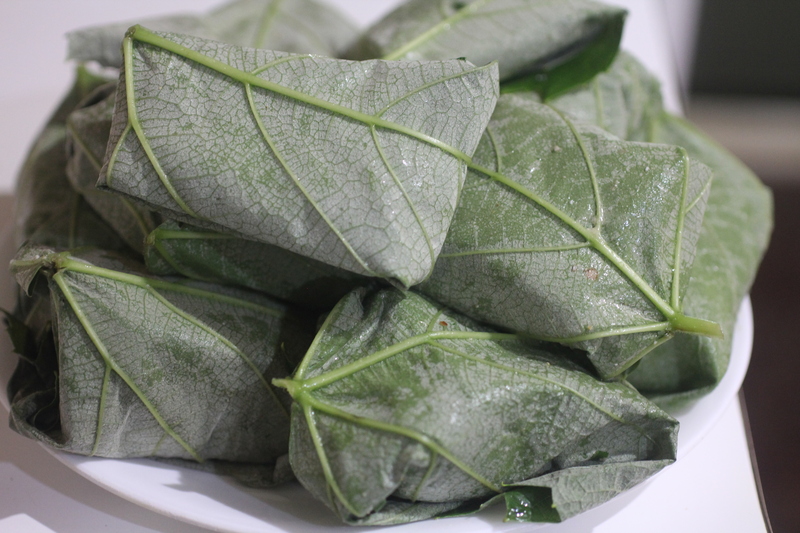 Also, wrapping finish and cooking them it banana leaves is a common thing for me growing up, I wanted to give the grape leaves a try as I want to find a local alternative to this method of cooking. The recipe here is relatively effortless, I used a lime, garlic chive and tangerine marinade, and finished with a lemon and red onion sauce. The fish turned of too be incredibly moist and flavorful. I however will confess, that even the 7 to 8 minutes of grilling was a little bit too much on a super hot day. However the reward for my braving the heat was a very satisfied family. Simple, easy and elegant, this dish will definitely be a frequent visitor on my table. Once you try this very easy recipe, you will realize why. 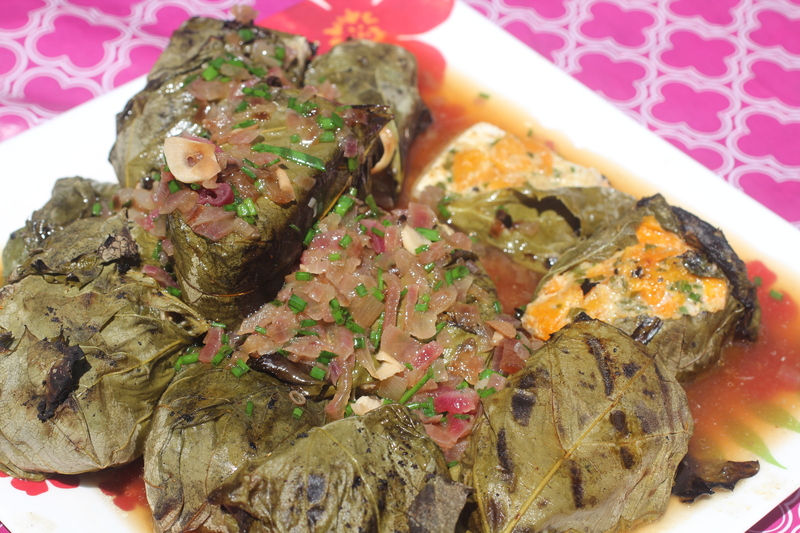 A simple and very easy preparation of fish baked in grape leaves, resulting in a very flavorful and elegant recipe. Cut the fish into 12 11/2 inch pieces. Toss with olive oil, garlic chives, tangerine, salt and the brown sugar. To prepare the grape leaves place in boiling water for 1 or 2 minutes to soften. Spread out on a place and place a piece of salmon with the marinade and carefully wrap and tuck the edges to form a secure package. Set this aside for at least 30 minutes or a few hours. To complete, place on a grill for 6 to 8 minutes, alternately bake for about 20 minutes at 350 degrees. To finish, heat the butter and add in the red onion and saute lightly for about 5 to 6 minutes, until softened. Squeeze in the lemon juice and add in the water and salt and simmer for about 5 minutes. Pour this over the salmon, carefully remove the wrappers and serve. If you wish you can use canned grape leaves, but they need to be carefully washed before using.